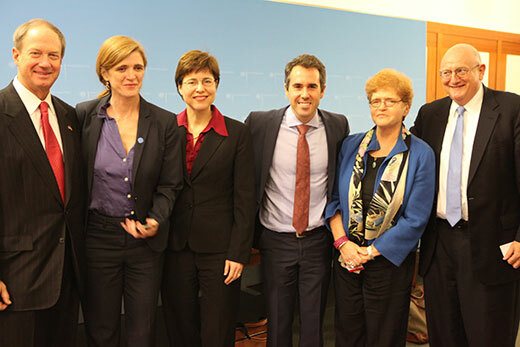 Emory Professor Deborah Lipstadt (second from right) was appointed to a six-member presidential delegation led by U.N. Ambassador Samantha Power (second from left). Photos courtesy U.S. Embassy Berlin. For years, Emory professor Deborah Lipstadt has been tracking anti-Semitic incidents, both large and small, as they flared up across Europe like scattered spot fires. To Lipstadt, Dorot Professor of Modern Jewish and Holocaust Studies, the rise in contemporary anti-Semitism throughout Europe — and the failure of communities to crack down on it — is more than a troubling trend. “To Jews in many European communities, as much as a physical assault and violent rhetoric, it represents an inner assault on their security,” she explains. That was one of the messages Lipstadt took from Berlin last week as she joined a six-member delegation appointed by President Barack Obama to attend the 10th anniversary of the Organization for Security and Cooperation in Europe (OSCE) Conference on Anti-Semitism, held Nov. 12-13. The event, which was organized by the Federal Ministry of Foreign Affairs, Swiss OSCE Chairmanship and the OSCE Office for Democratic Institutions and Human Rights (ODIHR), drew international political leaders, government officials and civil society representatives from across the OSCE region. “Ten years ago the OSCE States, meeting at the Federal Foreign Office in Berlin, made a strong commitment to oppose anti-Semitism — events witnessed in many European countries this summer have shown that the fight against anti-Semitism is, regrettably, still necessary and urgent,” said Federal Foreign Minister of Germany Frank-Walter Steinmeier, who hosted the conference, during introductory remarks. 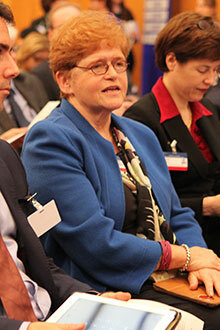 Professor Deborah Lipstadt, shown here attending the Berlin conference, says the event will provide fodder for her ongoing research into contemporary anti-Semitism. Led by U.N. Ambassador Samantha Power, a foreign policy and human rights scholar and former Atlanta resident, the delegation gathered in Berlin to explore challenges related to the rise of anti-Semitism in communities throughout Europe, which has increasingly taken new and troubling forms. In the past 20 years, Europe has seen a renaissance of Jewish life, notes Lipstadt. While many Jewish communities are flourishing, the recent rise in anti-Semitism presents a danger of that progress being reversed, she says. For many of these young Jews, emigrating is not easy. And so they remain where they are, but elect to disappear from Jewish life, she explains. And increasing numbers are leaving. “It’s kind of mind-boggling, more than 60 years after the end of World War II, small towns in Europe are poised to become empty of Jews,” Lipstadt observes. “Some of the French and Belgian Jews we spoke to, who can trace their families back 100 years, are saying, ‘I’m not secure here.’ That should send a shiver up the spine of the leaders and the population of their countries,” she adds. This marks the second time Lipstadt has served on a presidential delegation to the international OSCE conference on discrimination. Her first appointment came 10 years ago under the George W. Bush administration. This year, the invitation to attend the two-day conference came with little notice — a call came from the White House only days before the event. Working with the U.S. State Department, she was advised on formal protocol, even down to how she should dress. “Overall, it was a great experience. I was on the ground an intense 40 hours,” says Lipstadt, who adds that it will provide fodder for her ongoing research on a book project, planned long before the conference, that explores the rise of contemporary anti-Semitism.